The “König Ludwig Bridge” in Kempen is the worldwide oldest railway bridge, a unique monument from the golden age of rail and one of the last remaining timber bridge based on the American “System Howe”. This bridge construction is a landmark for the new support structure ideas and the beginning of the accurate structural design calculation. 2012 the bridge received the awarded for “historical landmark of architectural engineering” in Germany. 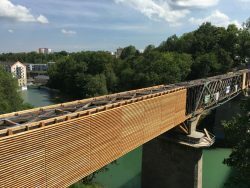 The bridge was damaged over the time of 160 years so that the use as a pedestrian and cyclist connection over the river Iller was prohibited. The monument-related restoration of the “König Ludwig Bridge” is scheduled for finalization in beginning of 2019. The bridge construction is a “Howe´scher” truss girder with double infill masonry and prestressed tension rods. The building height is 5,26m and the width 3,85m. The horizontal bracings are in the upper and lower bracing level. The spans of the Howe girder of larch wood from Switzerland are 38m, 55m and 30m, in total 123m. After the bridge has been lifted out of position and transported to a near field-workshop a professional survey and restoration has been carried out before the technical sophisticate reinstallation started. 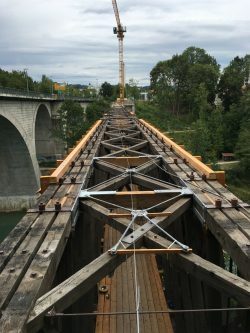 For the static reconstruction of the horizontal diagonal crosses in the upper and lower bracings and of the vertical diagonal crosses m•connect tension rod systems have been installed with different sizes. With the monument-related restoration the “König Ludwig Bridge” considers the national and international high significance of the Building.